You may have read my iBook article, where I shared my story of getting a Graphite iBook SE, complete with manuals and recovery discs, for a bare $50. I sure was lucky. Well, it's happened again. I was offered a 500 MHz iMac G3 DV SE with 512 MB of RAM and an 80 GB drive for $65. Lucky, eh? I simply couldn't say no. It even had the original mouse and keyboard. As I believe one should always format a used computer, I installed OS X 10.3 "Panther" on it. It works like a charm. And you know what? It integrates fine with my Vintage Mac Network - well, at least part of it. When I hooked up the Quadra 610 server to ethernet using a recently acquired NuBus card, the iMac was able to identify it as a network device and could access the files on it! I could even use the 11-year-old Calculator application of System 7.5 - using Classic Environment, of course. But still, cool! There must also be some way to access the computers hooked up to the Quadra by LocalTalk and use it as a bridge to let every G4 and G5 in my house access the Vintage Macs. Nice that a modern computer can be networked with one from 1994. To get back to the iMac itself, I only need one word: awesome. Panther runs great on it, with the only flaw being that Safari won't let me access my school's Citrix network. I have to use the obsolete Internet Explorer 5 for that - but it works. And, to my surprise, DivX movies play fine. After all, it's a speedy 500 MHz! My 400 MHz Lombard won't let me do that. It's cool how only 100 MHz can make such a difference. In the PC world, there is a very, very minor (if any at all) difference between a 400 MHz Pentium III and a 500 MHz model. And, of course, the DVD movies work fine too. I can even hook the iMac up to my 32" JVC television by using the VGA port. Let's talk about the design of the iMac. Like the iBook, some people find it to be way too "childish", but that isn't the case with me. I think the iMac is a very stylish piece of technology and imagine how cool it must have been in 1998, when the first model was introduced. No ugly beige box. No keyboard with 4" tall keys. Power superior to a normal Pentium II packed into a small case (screen included!). And there's no step 3. 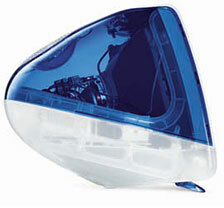 Like Steve Jobs said in 1998: "The back of the iMac looks better than the front of the other guys!" True. Now let's move on the the performance and upgradability. The performance is superior to what I had been expecting. Under Panther, it runs like a charm. And I've been told that it should be even better with Tiger, but that can wait. I am very happy with Panther for the moment. The 80 GB drive is very silent - after all it's only 9 months old. And 512 MB of RAM is very nice under Panther, which runs well on even 256 MB. If you ever tinkered with the first iMacs (Revisions A through D), you know that those machines just don't want to get upgraded. This is not the case with the Special Edition and DV models. RAM is accessed by opening a small door on the bottom of the computer, and by removing some screws in there, the cover slides off, and there's the logic board and processor - just waiting to be replaced by a G4 upgrade. 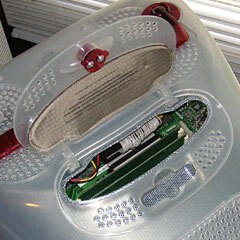 And the hard drive is there too. The cables are standard ATA-133 IDE cables. The memory sticks are not SO-DIMM PC100 sticks like the previous models. They are full-fledged SDRAM PC133 sticks - the same sticks you would find in an old Beige Box. If you find one of these on eBay, consider placing a bid. 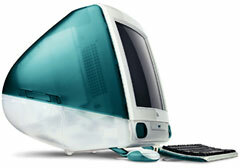 Please note: The iMac G3 is not a gaming machine and can not be compared to the faster G4 models or the Power Macs. But it is a very stylish computer for word processing, watching movies, and browsing the Internet. And it's actually smaller than the earlier iMacs, which means lower shipping costs. My next step will be to integrate my LocalTalk Macs with the newer ones, using the LAN equipped Quadra and the Classic II as bridges. I'll be sure to write about it and share my experiences!